From the 1st June 2017 Aiguille took over the manufacture and distribution of Snowsled pulks, hauling equipment and the Mountain Rescue Vacuum Mattress. 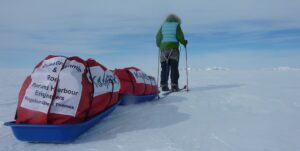 Snowsled was established in 1988 and began by making Nansen sledges for the British Antarctic Survey and also kevlar pulks. 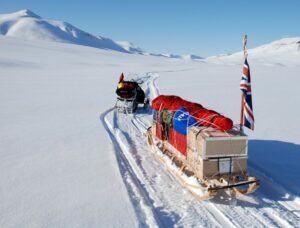 Since then Snowsled manufactured for a whole range of polar travellers, including adventure seekers and polar challengers, expeditions with a mixture of science and fun and governments and universities around the world with national collaborative programmes of scientific research. All products were ‘Made in Britain’; sleds and all sewn items were produced ‘in-house’, giving both the benefit of quality control and the advantage of being able to respond fast to non-standard requests. In the early 1990’s Ventile clothing and pyramid tents followed. In 2007 Snowsled produced the first HDPE plastic pulks which have since risen in prominence and recognition as they have proved themselves to be a much cheaper, more user friendly and equally efficient alternative to composite pulks. In addition, Snowsled had recreated older sled designs from over 100 years ago which have appeared in a number of TV films. They also developed and manufactured equipment for the emergency rescue services, including the full-body vacuum mattress developed specially for the Mountain Rescue Committee of England and Wales. This design has been in commission for over 20 years. Aiguille have now moved production of the HDPE pulks and Mountain Rescue vacuum mattresses to Cumbria alongside our existing outdoor equipment production. We are looking forward to continuing to develop this exciting product range.